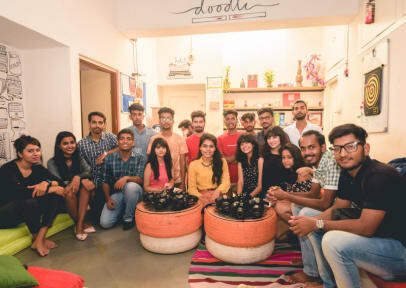 Doodle Rack i Jaipur, Indien: Reservér nu! 24 hours advance cancellation otherwise no refund. anyone ready to understand the concept. we are more than happy to assist you. 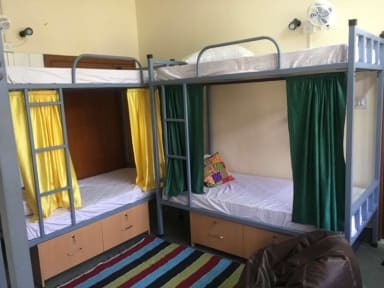 * Hostel is 500 metres from the metro station. it costs INR 11 to city center, INR 8 to bus stand and railway station. * We host Free HI_SPEED WI-FI. * We provide YOGA services at a nominal charge. Chilling areas (a must on our list when we travel) a terrace lounge, a soundproof underground indoor lounge(equipped with PS2, Projector, DVD player,satellite connection), living room (equipped with a library), a small and cozy patio, a garden and a private area for our female guests. We would be hosting various events such as karaoke nights, night walking tours, movies nights, and many more and yes, it would all be on us.